As autumn wanes and winter beckons, cooler weather invites outdoor dining. Here in South Florida, late autumn is a splendid time to settle into a cozy waterfront table and watch the world glide by. We traveled along the ocean and Intracoastal Waterway –from Lake Worth to Hollywood – to select this year’s choices for fine waterfront dining. 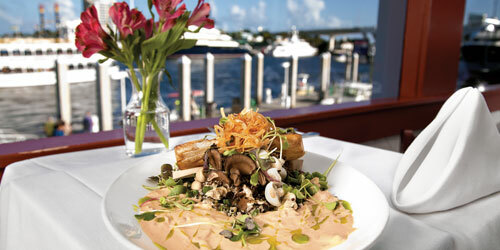 Perch on a barstool overlooking the sand and the ocean and enjoy breakfast or lunch at this Lake Worth Pier landmark. Great cocktails and food that is surprisingly fresh. Weekends are busy. While every table at Caffe Luna Rossa doesn’t come with a water view, this Ocean Boulevard Italian restaurant is top notch and well worth the wait, whether for brunch, dinner or a pit stop at the bar for a tasty bloody Mary or glass of one of their fine wines. Overlooking the Atlantic Ocean from the second floor of Boston’s on the Beach, 50 Ocean offers breathtaking views from floor-to-ceiling windows and a truly fine dining experience. Private dining available. Just west of the ocean on Atlantic Avenue, Deck 84 is a preferred boating stop any day of the week. The vision of renowned local restaurateur Henry Rapoport, Deck 84 takes the casual waterfront eatery offerings up a notch with an emphasis on local, fresh and flavorful. Occupying the former Old Calypso space directly across from Deck 84 is the recently opened Hudson. Embracing the motto “Love Thy Craft,” the vibe here is hip, eclectic and many menu items are made from scratch. Dubbed the only waterfront dining experience in Boca Raton, Boca Landing at the new boutique Waterstone Resort & Marina offers just that, along with “inventive” cuisine and a selection of global wines. Enjoy the view of the Boca inlet while sipping on an artisanal cocktail. Not to be confused with any other casual, open-air beachfront restaurant in the area, Oceans 234 is worth visiting not just for the location and the view, but for the fresh seafood, sushi and cocktails. Chef Victor Franco hosts monthly foodie sessions that are fun and flavorful. Word of mouth may soon lead you to Sunset Catch, located above the marina at Sands Harbour. Chef/owner Mario Spina hails from Italy and makes most of the pasta in house, while ensuring his seafood, raw bar and entrées are the freshest available. As its name would suggest, this is a beautiful spot for a romantic sunset dinner. A casual, seat-yourself, no frills restaurant located on the Anglin’s fishing pier in Lauderdale-by-the-Sea, Anglins Beach Café may surprise and delight the most discerning of foodies with its organic menu items and refreshing cocktails. A terrific oceanfront location for breakfast, lunch or dinner. Warm beer in plastic cups and the weekly Hot Bod contest are long gone here, since Shooters Waterfront underwent a transformation backed by the culinary team from the Grateful Palate. A recent upgrade has added even more dock space, which means weekend lunches, dinners and Sunday brunches will be bustling. Great burgers, beer and people watching are the items on order at this eclectic waterfront hot spot in Hollywood. Great news, except for the most barnacled purist, they now accept credit cards. A delightful spot for a delicious waterside breakfast, brunch or a romantic Italian-inspired dinner.